A few classic ingredients come together and bang - it's summer, and you're living the good life. 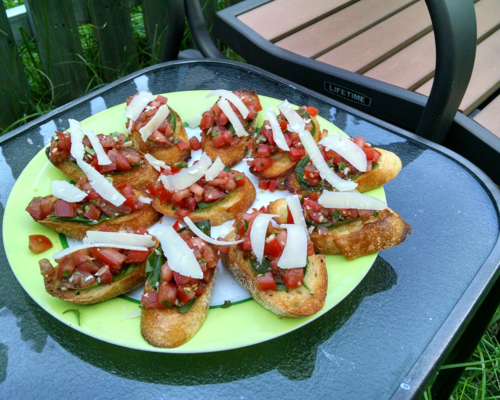 A plate of Tomato-Basil Crostini, ready to party in the Adventure Kitchen. 1. Combine the tomatoes, minced garlic, 1 Tablespoon of olive oil, the parsley and the vinegar in a bowl. Stir in a couple of pinches of salt. Allow the mixture to sit while you prepare the crostini. 2. Preheat the oven to 400 degrees. Slice the baguette diagonally into about 15-20 rounds about 1/2-inch thick each. You may not use the whole baguette, depending on how long it was to start with. 3. Lay the rounds in one layer on a rimmed baking sheet and put them in the oven for about 5 minutes, until they are lightly toasted. Flip them over to the other side and continue toasting them until they are lightly toasted on the second side, about 3 more minutes. While the slices are toasting, pour about 4 Tablespoons of olive oil into a small dish and locate a pastry brush, so you will be ready when the crostini come out of the oven. 5. Peel the remaining clove of garlic and rub it onto each of the crostini, then arrange the crostini on a serving platter and lay one basil leaf on each one. 6. Taste the tomato mixture and add a bit more salt if needed (it should taste deliciously tomato-ey, but not salty). When the tomatoes are just right, carefully spoon a mound of tomatoes onto each crostini. 7. Use a vegetable peeler to shave long pieces of the cheese onto the crostini, and serve. This dish is a crowd-pleaser. But before it even gets there, it's a you-pleaser. This is a good thing if you are making a platter of crostini to enjoy for your own lunch. But if you are making these for a party, you may lose a few to the "I better taste this one more time" thing. But hey, it's your party! When you dice up all those delicious tomatoes, you're going to have a choice to make. Will you leave all that flavorful juicy pulp in the dish, or strain it out? Leaving it in will mean you've got a whole lotta juice in the bottom of your bowl of tomato bliss. I usually use a slotted spoon to scoop the chunky tomato pieces out of the bowl leave the flavorful liquid behind. Then, you could toss this liquid with some salad greens or something, and you've got a whole 'nuther dish of summer to feast on.